It’s happened to every customer service rep. They answer the phone or say hello and the customer seems angry or upset right from the start. It’s easy to fall into the trap of taking things personally and becoming defensive, angry or intractable in response. Now, you can help your reps turn those customers around with this five part training tool. The Guide to Handling Difficult Customers takes readers through seven steps to transform a dissatisfied customer into a satisfied, loyal, long-term customer who knows your company can be counted on. 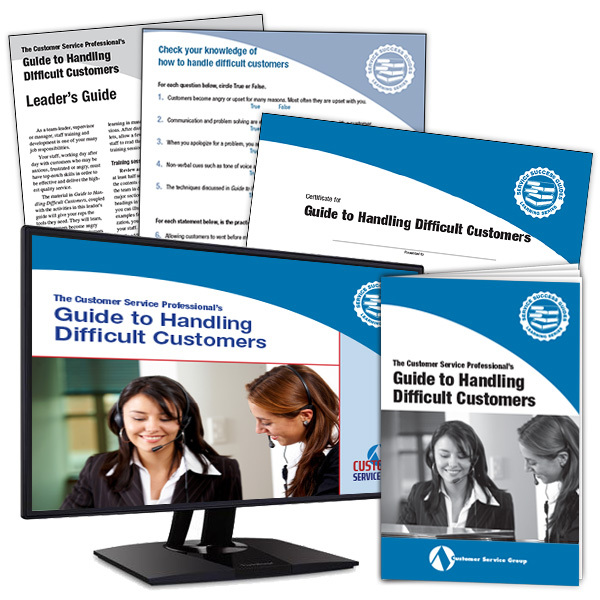 It includes information your reps can use to understand why customers become angry or upset; techniques to calm customers and remain calm themselves; detailed complaint handling techniques including key words and phrases; plus an important section on how to recover from a difficult call and get ready to give the next caller first-class service. Why do customers become angry or upset? It’s happened to everyone who works in customer service. You answer the phone or say hello and the customer is angry right from the start. These customers raise their voices, use abusive language, won’t listen to reason, or are simply rude. It’s very easy to fall into the trap of taking such behavior personally and becoming defensive, angry or inflexible. But it’s your job to take customer calls or work with them in person — all types of customers with all types of attitudes. The most important thing to remember is that difficult customers are relatively few and far between. It’s just that those unpleasant interactions loom large in our memories. When you do encounter a customer who is truly angry and upset, there are a series of basic actions you can take to calm the customer, resolve the problem and maintain your own professionalism. These techniques apply when you are working with internal customers (members of your own department or organization) or with external customers (customers outside of your organization). 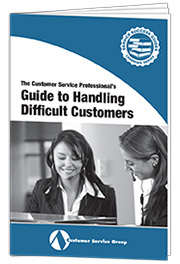 Guide to Handling Difficult Customers is guaranteed. We want you and your reps to use this valuable resource and put its ideas to work in your department. Then, if you are not 100% satisfied, you may return your materials within 30 days for a full refund.